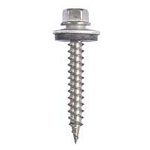 I do remodeling and have used a large variety of screws, for the application I used these for I cannot think of any type that would have worked better or even as well. 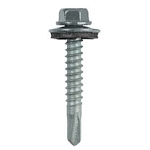 These metal roof fasteners are high quality and work as they should. I replaced old rusted fasteners with these new galvanized screws. I added some where no screws had been installed before and they penetrate 2 layers of metal roof easily. I will purchase again. roofthings.com is a very good company with the lowest cost on metal roof fasteners, I could find. This is our second order of the same #10 Hi-lo screws. We are very satisfied. This old house of ours needed a galvalum tin roof. You offered these screws at a less expensive price tan we could get local. The length and size are great. The point on screw really does dig in. If the rubber seal/washer would be a little thicker it would have been perfect. 5 stars!